You will find below the horoscope of Kourtney Kardashian with her interactive chart, an excerpt of her astrological portrait and her planetary dominants. Horoscopes having the same aspect Pluto sextile Midheaven (orb 0°07'): Adolf Hitler, Rihanna, Nicolas Sarkozy, Elvis Presley, Monica Bellucci, Ryan Gosling, José Bové, Marine Le Pen, Russell Crowe, Orlando Bloom, Nelson Mandela, Matt Damon... Find all the celebrities having this aspect. Horoscopes having the same aspect Mercury trine Jupiter (orb 0°53'): Monica Bellucci, Prince Harry, Duke of Sussex, Arnold Schwarzenegger, Vincent van Gogh, Katie Holmes, Muhammad Ali, Ian Somerhalder, Virgin Mary, Gordon Ramsay, Eva Joly, Alexander Skarsgard, Kate Hudson... Find all the celebrities having this aspect. Celebrities born the same day: Conan O'Brien, Zazie (singer), David Tennant, Laurent Baffie, Nadine de Rothschild, Rosie Huntington-Whiteley, Suri Cruise, Melissa Joan Hart, James Woods, Olivier Besancenot, America Ferrera, Maria Bello... List of all the celebrities born on April 18. Celebrities being the same height: Scarlett Johansson, Kim Kardashian, Jodie Foster, Mahatma Gandhi, Natalie Portman, Amy Winehouse, Renée Zellweger, Vanessa Paradis, Mila Kunis, Audrey Tautou, Monica Cruz, Carmen Electra... List of all the celebrities being 5' 3" tall. Celebrities clicked on in real-time: 577,234,178 times. Kourtney Mary Kardashian (born April 18, 1979 (birth time source: Viktor E., Astrodatabank, BC)) is an American celebutante, socialite, businesswoman, television personality, and model. She is best known for her appearances on the reality show Keeping Up with the Kardashians. Kourtney Kardashian was born in Los Angeles, California of Armenian (father) and Dutch-Scottish American (mother) descent, to attorney Robert Kardashian and Kris Jenner (née Houghton), and is the oldest child of Kris Jenner and Robert Kardashian. Robert Kardashian, best known for being O. J. Simpson’s lawyer during his murder trial, died on September 30, 2003. Her mother, Kris, divorced Robert in 1989 and married former Olympian Bruce Jenner in 1991. Here are some character traits from Kourtney Kardashian's birth chart. This description is far from being comprehensive but it can shed light on his/her personality, which is still interesting for professional astrologers or astrology lovers. 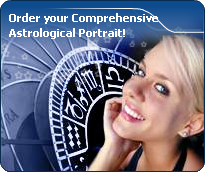 In a matter of minutes, you can get at your email address your astrological portrait (approximately 32 pages), a much more comprehensive report than this portrait of Kourtney Kardashian. Kourtney Kardashian, the nocturnal North-eastern quadrant, consisting of the 1st, 2nd and 3rd houses, prevails in your chart: this sector favours self-assertion and material security to the detriment of your perception of others. You consider self-transformation to be a hazardous adventure. You are inclined to seek stability and you tend to protect yourself with your actions. Possession, acquisition but also communication, without opening up too much, are part of your deep motivations. You are rather autonomous and constant, however it is important that you pay more attention to others, so that you can improve your outcomes. Kourtney Kardashian, Fire is dominant in your natal chart and endows you with intuition, energy, courage, self-confidence, and enthusiasm! You are inclined to be passionate, you assert your willpower, you move forward, and come hell or high water, you achieve your dreams and your goals. The relative weakness of this element is the difficulty to step back or a kind of boldness that may prompt you to do foolish things. The predominance of Water signs indicates high sensitivity and elevation through feelings, Kourtney Kardashian. Your heart and your emotions are your driving forces, and you can't do anything on Earth if you don't feel a strong affective charge (as a matter of fact, the word "feeling" is essential in your psychology). You need to love in order to understand, and to feel in order to take action, to the detriment of a certain vulnerability against which you should learn to fight. Air is under-represented in your natal chart, with only 2.81% instead of the average 25%. Air symbolizes the values of communication, exchanges with others, but also adaptability and flexibility abilities: if you don't get out of your cocoon to talk, to show interest in others, and to socialize, you may have problems understanding others. Because of your lack of flexibility or of your refusal to adapt yourself, you may be suddenly overwhelmed by events. You should get into the habit of talking, of phoning, and of thinking in terms of "mobility, flexibility, adaptability, change" in every circumstance. It will spare you so many troubles! The Mutable mode is the most emphasized one in your natal chart, Kourtney Kardashian, which indicates a mobile character that is curious and thirsty for new experiences and evolution. You are lively and flexible, and you like to react quickly to solicitations, but don't confuse mobility with agitation, since this is the danger with this configuration - and with you, stagnation is out of the question. Security doesn't matter as long as you are not bored. You optimize, you change things, you change yourself... all this in a speedy way. Your angular houses, namely, the 1st, 4th, 7th and 10th houses, are very emphasized in your chart, Kourtney Kardashian: according to the Tradition, they are the strongest and most dynamic houses. Should the rest of your chart concur, angular houses suggest that you are an enterprising, energetic and assertive woman. Indeed, angular houses are said to generate impulsions and to give a powerful and domineering personality. The 1st, 10th and 6th houses are the most prominent ones in your birth chart. From the analysis of the most tenanted houses, the astrologer identifies your most significant fields or spheres of activity. They deal with what you are experiencing - or what you will be brought to experience one day - or they deal with your inner motivations. After this paragraph about dominant planets, of Kourtney Kardashian, here are the character traits that you must read more carefully than the previous texts since they are very specific: the texts about dominant planets only give background information about the personality and remain quite general: they emphasize or, on the contrary, mitigate different particularities or facets of a personality. A human being is a complex whole and only bodies of texts can attempt to successfully figure out all the finer points. Your sensitivity is withdrawn, Kourtney Kardashian: more than anyone, you tend to lock yourself in your ivory tower, as you are aware of a kind of superiority that may be real, though overrated. Your moods are not perceptible because you control them with a tight fist. It is difficult to know if you are happy or upset because you show nothing. You avoid situations which compel you to reveal your emotions because you are not demonstrative. Please, be aware that it is not your amorous behaviour that is being analyzed, but the daily expression of your sensitivity. You dread the crowd and you need calm, and even solitude, to feel comfortable. You are well-equipped to remain balanced in all circumstances, but it may prove beneficial if you progressively take a relaxed attitude and show more dedication, as you are worth it; it is easier for you to exteriorize your feelings when your projects or your ambitions justify that you do so. You do not practice gratuitous outpourings, particularly when your are with a group, because you are afraid to open up, as if you were on the defensive, without any reason most of the times. Compassion and self-sacrifice: you are fond of this romantic mode and you are willing to express your feelings, the intensity of which is unlimited, Kourtney Kardashian. With excitement and imagination, you dream your amorous relationships as much as you actually live through them. The line between the concrete world and your huge hopes is so tenuous that you don't know anymore where it is, although your particularly rich sensuality prompts you to experience your feelings concretely. You want to share communion and passion with your partner. The lyrical flights of your feelings break from your heart as waves that you do not attempt to control because they give you a real, almost voluptuous and carnal joy. You give a lot – sometimes too much - without reservation, almost without propriety, totally revealing your vulnerability during your amorous exchanges because you are sure of the quality and the might of your feelings: they are so powerful and overwhelming that you are aware that nothing can resist them. The ruler of the Ascendant, Kourtney Kardashian, is Neptune. It is posited in the sign of Sagittarius and gives you a strong inclination for the open sea and for freedom. Loyal and benevolent, you put things into perspective, and you understand the true value of things, perhaps precisely because you travel - whether actually or mentally - and that stepping back from your intimate environment enables you to better perceive what is important and worthy. Impulsive, impatient, quick and energetic? You? Yes of course, Kourtney Kardashian. You are courageous and able to make intense and huge efforts for a short while; and what a terrific rhythm! In sport, of course, or in your sexuality, you are not the type who ponders, you take action instinctively, “in a rough and ready way”. You are outspoken, you do not worry about other people's opinion and you do not allow them to slow you down or to judge you. You must succeed or fall apart. You cannot be bothered with diplomacy or with compromises. You are too straightforward and unyielding to waste time with finesse or shrewdness. This is what makes you charming because, with you, one always knows where one stands. This text is only an excerpt from of Kourtney Kardashian's portrait. We hope that it will arouse your curiosity, and that it will prompt you to deepen your knowledge of astrology, as well as to visit and use the wide range of free applications at www.astrotheme.com.